If you’re passionate about baking, ready to boost your confidence in the kitchen, or thinking about a career as a professional baker or pastry chef, you’ve come to the right place! Chef Eric created this Baking Program for you! Our 10-Week Professional Master Baking Program will teach you what you need to know to succeed in today’s professional environment. We have students working for Wolfgang Puck at Spago, as Pastry Chef’s in France, in the finest restaurants across the U.S. – and the mom and pop bakery down the street – many times as owners! This French-based system is a comprehensive baking program designed to teach in individual modules that build from Cookies, Breads, Scones, Yeast Breads, Pies and Tarts, Cakes and Tortes, Puff Pastries, Custards, Sauces, Ice Creams and Soufflés, and graduates with Restaurant-Style Plated Desserts. Gluten-Free options are used wherever possible. Our baking classes encompass current techniques and original recipes to rival the finest dining establishments and culinary publications so that your pastries and desserts are timeless and treasured. You learn all you need to succeed in today’s restaurant kitchens, as well as master techniques that you can use at home. Recipe Development and Costing are key components of this program. We offer career guidance for those who are ready to embrace their passion and pursue a life in the culinary arts as a pastry chef. Many of Chef Eric’s students are baking professionally in bakeries, cafes and restaurants, or own their own businesses. Check out our Alumni here. Others have found culinary confidence in their private kitchens baking for family and loved ones, hosting parties and creating wonderful baked goods and delicious desserts. Below are descriptions of our classes, complete with links for easy registration. Classes are held weekly, 3 1/2 hours per day, for 10 weeks. Registration includes the CIA’s Baking/Pastry Textbook and an Embroidered Chef Jacket and Apron. Certificates are awarded upon completion of this Program. If you have any questions, or want to review our Payment Plan, please visit our FAQ page or email cheferic@culinaryclassroom.com. Come AUDIT a Professional Master Baking Program Class free of charge – you may sit in on a class and watch the action – email the office for dates and times – you must make an appointment. Class #1 – The Basics of Baking – Let’s get started! Students will learn different mixing and measuring techniques, including proper scaling and weighing of wet and dry ingredients. Then we dive into baking classic and contemporary items that do not require yeast. Recipes include Irish Soda Bread, Ginger Scones with Orange Butter, Cornbread Biscuits, Gluten-Free Muffins, French-Style Breakfast Muffins and Toasted Pecan Butter Cookies. Class #2 – Yeast Breads – In this class, students learn the importance of yeast, flour and water in the composition of breads. Proofing and fermentation of yeasts are introduced as well as recipe conversion techniques. 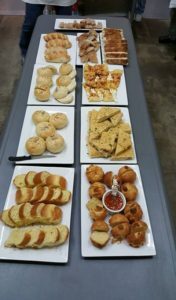 Chef Eric shares his culinary secrets for Pain de Menage (Country Bread), French Baguettes, Brioche, Focaccia Bread, Hamburger Buns, Whole Wheat Bread, Pizza Dough and more. Class #3 – Pie and Tart Doughs – Students will develop their baking skills as they learn to make Flaky or Crispy Shells for Pies and Tarts. Blind baking, dough docking and the use of pie weights are introduced. We will also be creating sumptuous sauces, such as Peanut Caramel Sauce and Chocolate Sauce, that can be drizzled to elevate baking creations to a tasty new level. Recipes include: Mom’s Pie Dough, Rice Flour Pie Crust for the Gluten-Intolerant, Apple Tarte Tatin, Lemon Tart, Chocolate Ganache Tart, Lemon Meringue Pie and White Chocolate Banana Cream Tart. We even add Swiss Meringue to the mix! Class #4 – Cakes and Tortes – Let them eat – and make – cake! In today’s class, students learn a selection of batter mixing techniques and apply these to the art of making cakes and tortes as well as a bevy of beautiful and tempting frostings. We also make a special GLUTEN-FREE Flour Cake. Recipes include: Torte Caprese, Carrot Ring Cake, Whipped Cream Pound Cake, Ancho Chile Devil’s Food Cake with Chocolate Ganache Frosting, Ginger Lime Curd Coconut Cake with Marshmallow Frosting, Chocolate Buttercream Frosting, Swiss Meringue Buttercream Frosting. 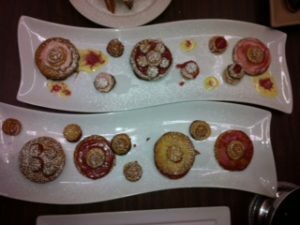 Class #5 – Dessert Soufflés – The importance of the egg is the focus of this class as students master the art of sweet Soufflés. Students learn what types of eggs work best for soufflés. Chef Eric also covers advanced preparation for soufflés, the use of Cream of Tartar and more. Soufflé recipes include Dark Chocolate, Citrus, White Chocolate, Caramel and Pear, decadent Chocolate versions AND Fallen Chocolate Cake. 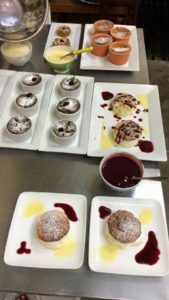 We will also cover how to confidently create sauces that will pair wonderful with the soufflés, including Crème Anglaise, Strawberry Sauce and Pastry Cream. Class #6 – Puff Pastry Desserts – Today, students will explore the world of puff pastry as they learn to make desserts utilizing this cleverly adaptable staple of a Master Baker’s kitchen. We will discuss Puff Pastry and create Napoleons, Turnovers, Sacrostains and Palmiers. Each student makes their own Puff Pastry to use in this class. Chef Eric teaches what types of flours work best and how this dough can be stored for future use. 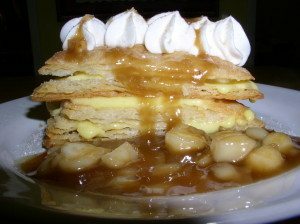 We make additional Pastry Creams and Sauces to use with our Puff Pastry Desserts. 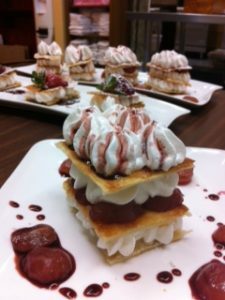 Class #7 – Sauces and Desserts – Often the secret of a successful dessert is in the sauce. Students will learn to make delicious toppings and sauces such as Chocolate Ganache Sauce, Cranberry Sauce, Caramel Sauce, Chocolate Sauce, Vanilla Sauce and more. We also create desserts that pair perfectly with these sauces such as: Chocolate Soufflé, Lemon Meringue Tart, Pastry Cream and Pate a Choux for Cream Puffs and Crème Chantilly Swans. Chef Eric will discuss proper sauce consistency for each of these desserts and sauces. Class #8 – Custards, Crème Brûlées, Puddings – Any pastry chef will tell you that the simple mixture of eggs and cream will yield almost magical and infinite variations. We explore many of them here, including Custards, Crème Brûlées, Clafloutis, Pot de Crème and Bread Pudding with Whiskey Cream. 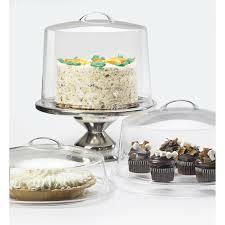 Chef Eric will discuss the benefits of baking dishes in a Bain Marie versus baking in a dry oven. Emphasis is placed on ramekin preparation, accurate baking time, and the ability to visually determine the doneness of the finished product. 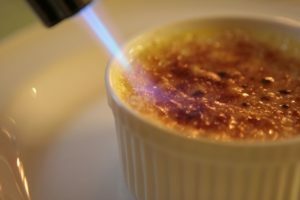 Students learn how to torch the sugar topping on the Crème Brûlées to finish this dessert. Class #9 – Ice Creams, Yogurt and Sorbet – Mouth-watering frozen desserts have become popular year-round. Students will learn to make their own crowd-pleasing desserts perfect for any situation and palate starting with basics such as Vanilla, Chocolate, Caramel and Coffee Ice Cream -we discuss many variations and serve in Vanilla Tulip Cookies. We move on to more exotic recipes such as Honey-Vanilla Frozen Yogurt, Lime Gelato and Avocado Ice Cream. Chef Eric will discuss proper ice cream consistency and length of storage for optimum quality, as well as common mistakes in Ice Cream preparation and how to avoid them. Class #10 – Plated Desserts – In this final class, students will prepare desserts and sauces, with emphasis on learning how to present restaurant-quality desserts. We cover Baked Alaska, Fruit-Stuffed Beignets, Waffles with Cardamom, Profiteroles, Pastry Cream, Chocolate Sauce, Vanilla Sauce, Espresso Cream Frosting, Classic Crepes, Banana-Rum Crepes and Cinnamon-dusted Churros. Chef Eric guides students in organizing the separate dessert components, how to time those components and quickly assemble them for optimum eye-appeal, quality and freshness. Chef Eric encourages students to be creative in their personal dessert creation as they utilize all of the skills gained in the series. Certificates will be presented at this final class session. Don’t wait to sign up! This program fills up quickly, so save your spot today. Register and Sign Up Today! I want more information about the Master Baking Program! Thanks for a great 4 week course! I’m really jazzed up about cooking now – can’t wait to get out there and buy a pasta making machine to crank out the linguini! My career takes a lot of my time. Chef Eric realized that I wasn’t looking to change careers and become a professional chef, but he still gave me the tools I need to be confident enough in my home kitchen. I just hosted a party with 50 guests in my home. I did the cooking myself, enjoyed every minute and my guests were very pleased. My party was a complete success! CHEF ERIC was my first professional chef instructor in Culinary Chef I and I’ve been devoted ever since. Having recently finished Culinary Chef II and III, I am now doing radio spots and cooking demonstrations. My career goals are closer than ever and I couldn’t have done it without CHEF ERIC and his school. If you want to experience a hands-on, very personalized culinary cooking series, you must sign up for Chef Eric’s Culinary Classroom! Chef Eric cares about his students, is an excellent instructor, and makes sure every person is getting the most out of his classes. 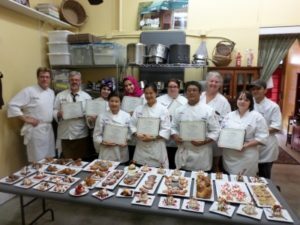 SaMiah had such a wonderful experience at Chef Eric’s Culinary Academy, she didn’t want it to end. I was amazed at all of the dishes they made each day in the amount of time given! Everything tastes great. We are so thankful to you for allowing her that experience. SaMiah is greatly considering the culinary arts as her future career. She does lots of cooking and helping in the kitchen at home as well. Thank You!